Air Charter Advisors is your source for private charter flights to/from Santa Fe, the capital city of New Mexico and a popular private & business aviation hub. Renowned for its cultural confluence and incredible southwest landscapes, it’s also home to the third largest art market in the United States. Renting a private jet and arriving at (KSAF) Santa Fe Municpal Airport is the most secure, stylish and comfortable way to arrive in New Mexico’s capital city, and the surrounding area offers 6 additional airports within 50 miles, including nearby (LAM) Los Alamos and (E14) San Juan Pueblo, both within 20 miles of the city center. ACA offers on-demand private jet charter service to/from Santa Fe, New Mexico without any hidden fees, membership charges or long-term contracts. Choose from thousands of modern, comfortable private jets, complete with a variety of luxury concierge services that perfectly complement your flight. We also offer private jet management and marketing services for aircraft owners, and can assist in private aircraft acquisition and sales. Booking your private flight with Air Charter Advisors means you’ll have an experienced broker working for you, ready to advise and arrange all the details for your upcoming flights at any time of day or night. Our company is Wyvern certified, giving you access to thousands of certified private jets and turbo-props located throughout the United States and around the world. We’re confident we can arrange the perfect aircraft for your trip with competitive rates, whether you’re flying domestically or internationally – all of the aircraft we use for private flights to Sante Fe and surrounding areas of New Mexico are operated by FAR Part 135 or 121 (or foreign equivalent) air carriers. Enjoy the peace of mind you get from working with a jet charter broker you trust, and ACA will become your comprehensive aviation solution for luxury air travel, aircraft acquisition and private jet management in New Mexico. Call or request a quote for a charter flight to Santa Fe, New Mexico. From arranging in-flight catering, luxury ground transportation, helicopter charters or having your aircraft managed or put on the market – consider our Santa Fe Private Jet Charter service your one-stop shop for all things private aviation in the Southwest. Clients can choose between 3 airports located within 20 miles of the city-center, each with a private FBO offering a variety of services to private travelers, pilots and aircraft. After arriving via private jet, we can arrange for luxury ground transportation to bring you to the resort or destination of your choice. Private helicopter lifts can also be arranged upon arrival. Additional airport options are available within 50 miles; see bottom of page for more details. Air Charter Advisors offers access to over 10,000 Wyvern-certified jet and turboprops for your private flight, as well as helicopter, piston aircraft and VIP airliners. Every plane we utilize is operated by FAR Part 135 or 121 (or foreign equivalent) air carriers, using only veteran pilots, not recent flight school grads. After you request a free non-committal quote, our Santa Fe Jet Charter brokers will provide a variety of aircraft options based on the goals and budget of your trip — choose between a cost-effective aircraft, an enjoyable private jet, or the most luxurious, stylish airliner on the market. Check out our Aircraft Gallery for more details on all of the aircraft available for your trip. Are you a luxury traveler looking for a new adventure? If you’re growing tired of the usual spots and want to experience something a little different, consider chartering a private flight to Santa Fe, the oldest capital city in the United States. The city consistently ranks as a top travel destination thanks to a unique blend of beautiful landscapes, rich history, cultural diversity, and incredible art, music and culinary scenes. Santa Fe, which translates to “holy faith” in Spanish, is part of the larger Albuquerque–Santa Fe–Las Vegas combined statistical area — learn more about private aviation in the surrounding areas of Albuquerque and Las Vegas. 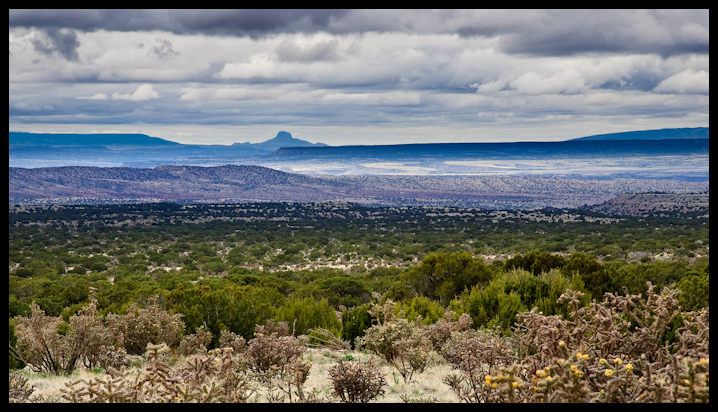 A lot of travelers head here just for its opera; although the actors take center stage, the theater often steals the show with incredible 360-degree views of the surrounding sandstone covered wilderness, complete with dramatic views of colorful southwest sunsets. The cultural confluence found here also attracts visitors year after year, where you can travel back in time and explore villages built by indigenous tribes more than 1,000 years ago. 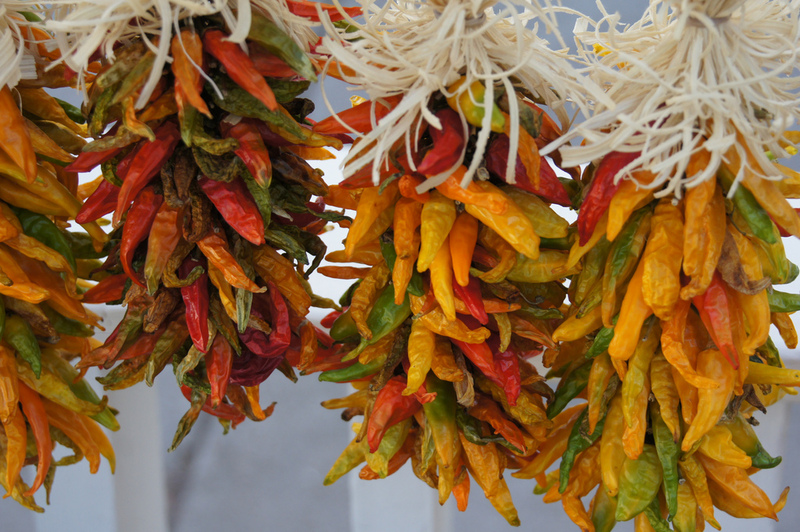 Home to famous artists such as Georgia O’Keefe and Alfred Stieglitz, there’s an extraordinary amount of art to be found, and with a diverse culinary scene, visitors can get an authentic taste of the Southwest. 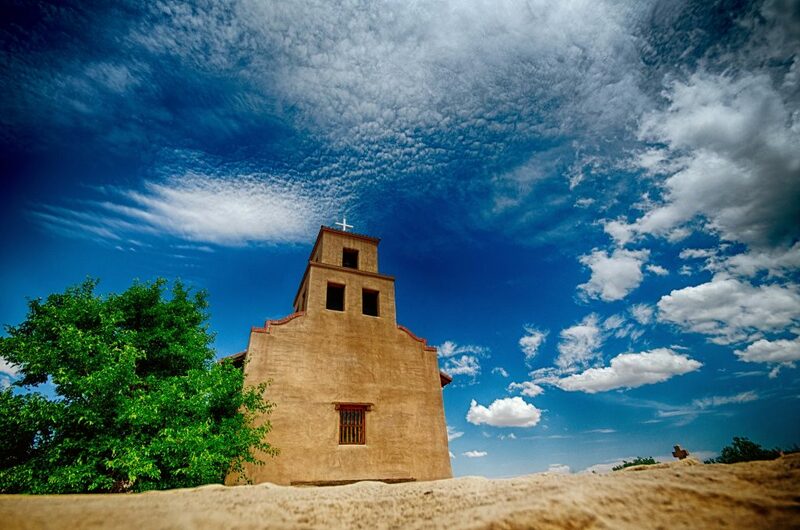 After being occupied for several thousand years by indigenous peoples, the city of Santa Fe was founded by Spanish colonists in 1610, making it the oldest city in New Mexico and the oldest state capital in the United States. Santa Fe was once the capital of Spain and Mexico’s Rio Grande territories, and the city became the capital of New Mexico after achieving statehood in 1912. Unless you’re an avid artist or collector, chances are you were unaware that Santa Fe is home to the 3rd largest art market in the United States, following only New York City and Los Angeles — an incredible feat when compare the city’s population of around 70,000 to that of mega-metropolises like NYC and LA. It all started when a number of artists flocked here during the early 20th century, including Georgia O’Keeffe and Alfred Stieglitz. 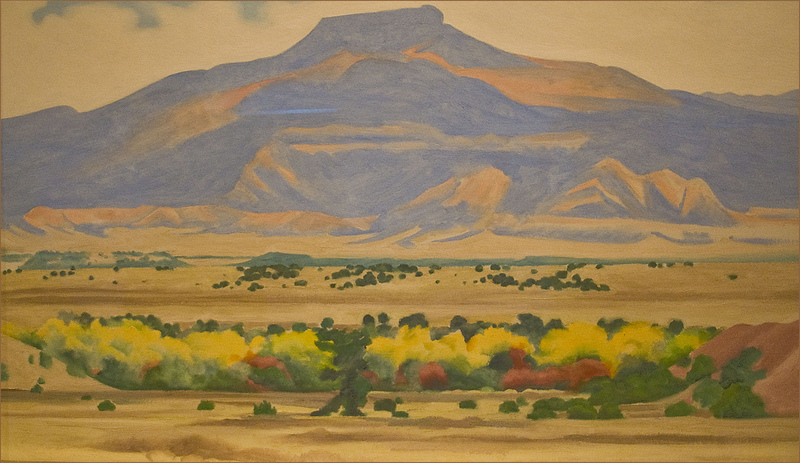 O’Keefe was renowned for incredible paintings of Southwest landscapes, many of which she painted from her home in Santa Fe. Although her most famous canvases are prominently on display in some of the world’s largest museums, a variety of her works are on display at Georgia O’Keeffe Museum, the site of her 20th-century home called “Ghost Ranch”, which is also the world’s largest gallery of her paintings. Igor Stravinsky, a Russian-born composer, pianist, and conductor, is widely considered one of the most important and influential composers of the 20th century. He’s also responsible for the Santa Fe Opera House, one of the world’s leading opera companies. Home to one of the most unique settings in stage and theater, the Opera House consistently ranks as one of the most unique venues in the world, and has led to a flourishing local music scene. The city and its surrounding region are also a popular place for spiritual journeys and to practice meditative arts, whether you choose to do so at one of several spas and resorts in the area, or in the solitude of the surrounding Southwest landscapes. Most visitors head to the historic downtown, especially the Plaza, a one-block square adjacent to the Palace of the Governors, home to the original seat of New Mexico’s government since the Spanish colonial era. Other popular attractions include Museum Hill, where you’ll find most of the city’s best art museums, as well as the Santa Fe International Folk Art Market, which takes place annually during the second full weekend of July. The Canyon Road arts area with its galleries is also a major attraction for locals and visitors alike. 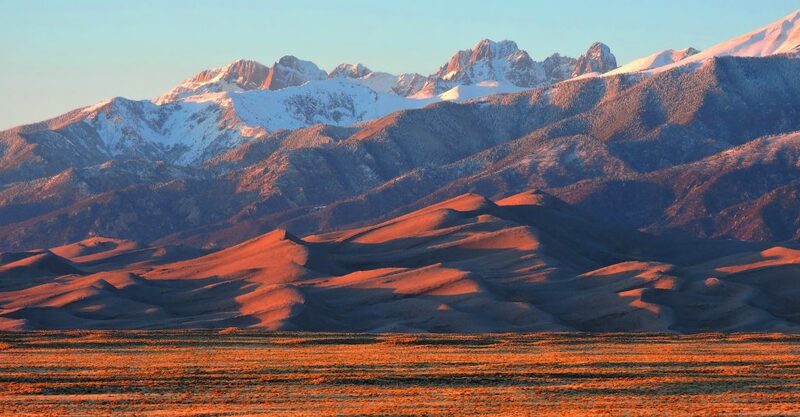 Many travelers find it particularly attractive during the second week of September, when the Sangre de Cristo Mountains turn yellow and the skies are clear and blue. This is also around the time when the annual Fiestas de Santa Fe takes place, celebrating the “reconquering” of the city by Don Diego de Vargas, which is highlighted by the burning Zozobra, a 50-foot marionette. Popular day-trips can include the town of Taos, located about 70 miles north. You can also visit the historic Bandelier National Monument and the Valles Caldera about 30 miles away. When there’s enough snowfall, Ski Santa Fe, the region’s aptly named ski area, is available, and it’s only about 16 miles north; Chimayo can also be found nearby, where many people complete the annual pilgrimage to the Santuario de Chimayo. Thanks to an attractive year-round climate, plenty of outdoor activities, and cultural offerings both in and around the region, tourism is a major component to Santa Fe’s economy. 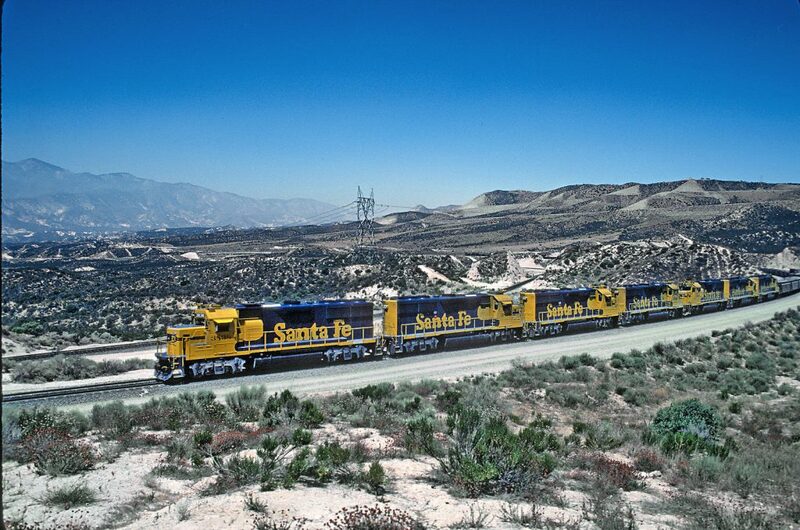 It’s also served as an important transportation hub dating back to the Santa Fe Railway in the late 1800’s. Outside of service industries, the city has been associated with science and technology dating back to 1943, when Santa Fe served as the gateway to Los Alamos National Laboratory (LANL), located about 45-minutes from the city. Other facilities include the Santa Fe Institute (SFI), which researches complex systems in physical, biological, economic, and political sciences. SFI has hosted Nobel laureates including Murray Gell-Mann (physics), Philip Warren Anderson (physics), and Kenneth Arrow (economics). The National Center for Genome Resources (NCGR) focuses on research at the intersection of bioscience, computing, and mathematics, and throughout the 1990s and 2000s, many technology companies opened to commercialize technologies developed by LANL, SFI, and NCGR. Due to the strong presence of these scientific institutions and an attractive for visitors tourist industry, the city regularly hosts scientific meetings, summer schools, and public lectures, such as the International q-bio Conference on Cellular Information Processing, Santa Fe Institute’s Complex Systems Summer School, LANL’s Center For Nonlinear Studies Annual Conference, and many, many others. 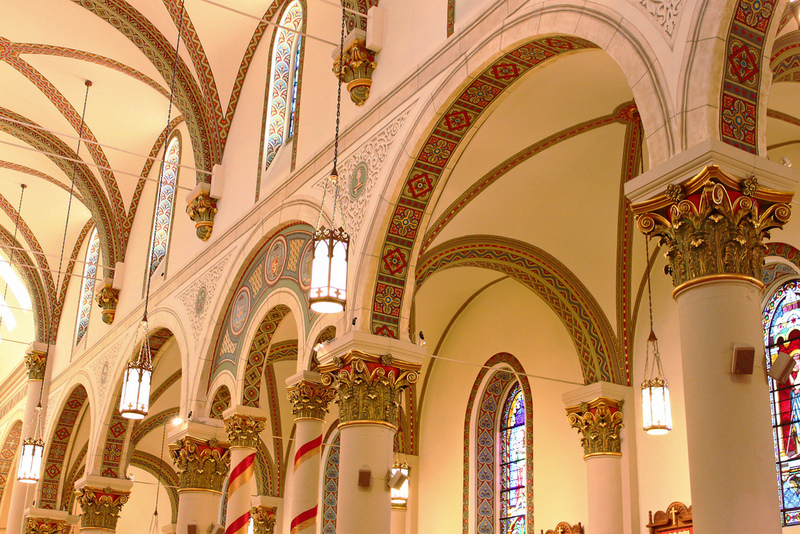 As capital and fourth largest city in the state of New Mexico, Santa Fe often caters to both business and governmental travelers, but it’s scenic beauty, cultural diversity, arts, music and cuisine make it one of the most unique travel destinations in North America. Private jet travelers will find that a majority of the hotels and B&Bs in Santa Fe are located in one of two areas: downtown near the Palace of the Governors and Plaza, or on Cerrillos Road, the main commercial street. 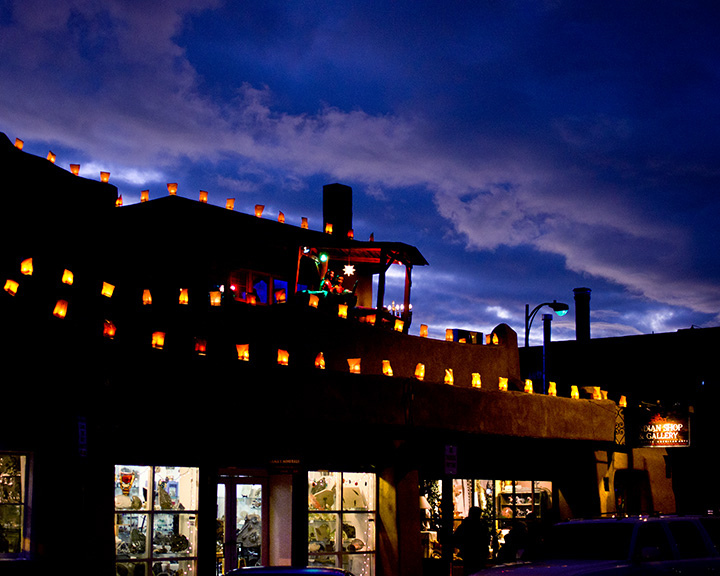 Although these two sections aren’t far from each other physically, the atmosphere can vary greatly between the two: Downtown has the charm & ambiance of an old Western village frozen in time, while Cerrillos Road feels more like a touristy shopping district in a major city. Luxury travelers can choose the Four Seasons Resort Rancho Encantado, the only five-star resort within 100 miles of Santa Fe, featuring 57 acres of unspoiled beauty tucked along the Sangre de Cristo foothills. The resort is perfect for southwest weddings and other events, offering 65 rooms casita guest rooms and suites, complete with their own fireplaces and private terraces. While searching other accommodations in the area, you’ll find a surprising amount of highly-rated three-star hotel and B&B Inn’s, but don’t let the number of stars attached deter you–some of these inns and spas offer exclusive, luxurious accommodations for travelers looking for a more quiet, intimate atmosphere; many of these resorts are perfect for romantic getaways or luxury weekend trips. Air Charter Advisors arrange private jet charter service to/from Santa Fe, New Mexico using the following airports listed below. The three airports listed below are located within 20 miles of the city center, giving clients the flexibility to choose the right airport for their flight. Fly private to New Mexico and arrive at Santa Fe Municipal Airport (IATA: SAF, ICAO: KSAF, FAA LID: SAF), a popular aviation hub located 10 miles southwest of the capital city. Facilities at (SAF) Santa Fe Municipal include three long asphalt runways, ideal for mid-size, long-range jets and even select airliners. Request a Quote or give us a call at 1-888-987-5387 to speak with one of our Private Jet Charter Santa Fe agents for your next luxury vacation, business trip, or special event. Whether you’re chartering a private flight for business or for pleasure, Air Charter Advisors can ensure that your private flight goes as smoothly and comfortably as is possible. Our team is available for you by phone and email 24 hours a day, 7 days a week to arrange everything from multi-leg private flights and private helicopter lifts to luxury ground transportation and more.